The description is "A hint of the 70's is in the air.....the season's trendiest garment - pyjama-style pants. 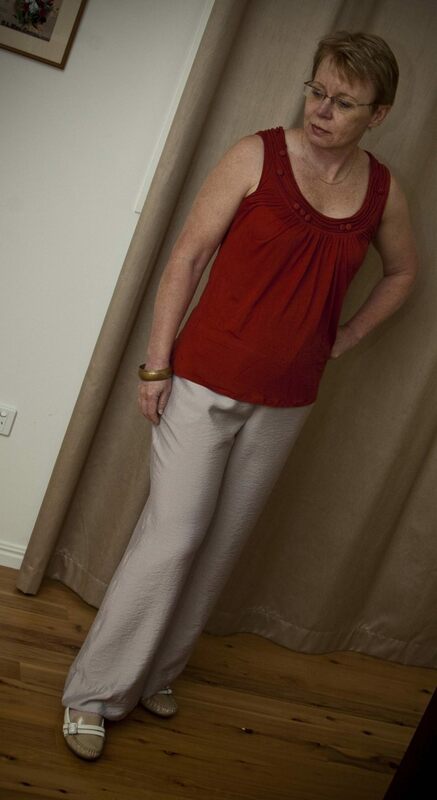 The pants are cut slender at the top to avoid adding extra fullness to the hips, then flare fully to the hem." The pants have a really interesting front with a angled front overlap/underlap which is held with a button. 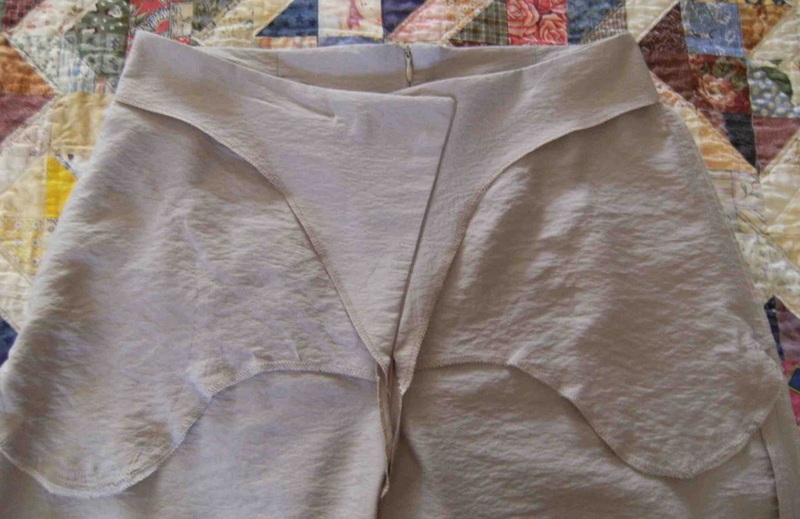 The button holds the layers together and thankfully the underlap is stitched shut inside. There is a invisible zip at the centre back to get in and out of these trousers. 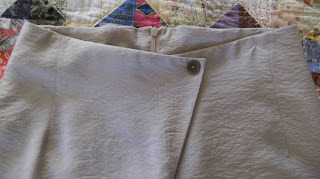 A picture showing the inside front facing and pockets. If you can handle the high waist-line I would recommend this pattern to you. I could not find a review of this pattern so I thought I would add my two cents in over at pattern review. The review is here for those interested.... Ciao! Wonderful pants Sue and the fit looks fabulous and now I need to dig out this pattern. Pants are lovely and they look great on you especially with the top tucked in. BTW are you coming back to simple savings, I haven't seen any of your posts on there, I miss them. They look really great and what a nice fit you have there. It's a shame the detail will be covered but they do look good even covered. Lovely pants, I am intrigued with this pattern. They look flattering and comfy. Those are great pants, and they fit you so well! Enjoy the vacation! Cute pattern and very flattering pants on you!! They look fabulous on you. It is a shame the cute detail is hidden if you wear your top out. These look really good. The fabric flows beautifully. Fab pants. Looks great on you. Love the top you have teemed them with. They are a lovely style. I like how they look flowy. I've wondered about this pattern before today. It looks great on you and your choice of fabric is perfect. I'm not sure the style would work for my hips, but I do love a highwaisted pant and it works with your top both in and out. Really very nice pants! Bravo! Resort wear ... photos of the blue linen shirt.